This is the first in what may or may not be an ongoing series of Certain Point of View-inspired fan-fiction by Children of the Force listeners. 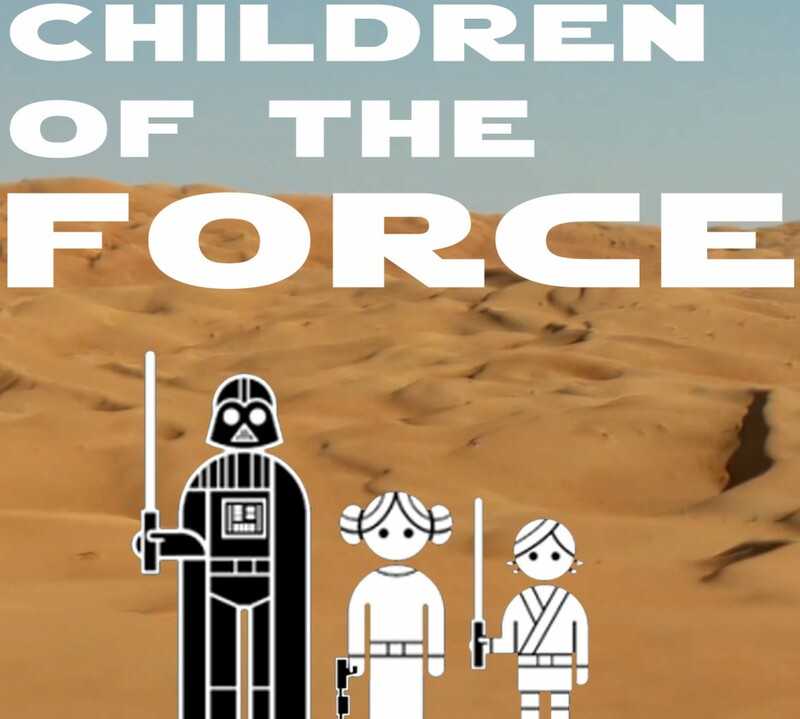 We’re honored to present this story by Nick from London, a long-time listener and contributor to Children of the Force. Enjoy! from the certain point of view of Nicholas D.C.
Garindan knew from the moment that he’d sold out those droids to the Empire that he was pretty much dead. In his defense, he was broke. Like, really broke. After being forced to flee his home world of Kubindi, he had travelled to many places – the lava lakes of Sullust, to sell faulty blaster recharges to the natives, whom he had dubbed “flappy-mouths”; the oceans of Kamino, where he’d attempted to sell neck-braces to the Kaminoans; the mountains of Jelucan; the towers and spires of Coruscant; this really weird diamond-shaped planet he’d steered clear of; and now, he found himself on the miserable sands of Tatooine. It was a sandy junkyard, but the creatures here were dumb enough to buy his blasters that fired backwards and his shock sticks that shocked the owner instead of whoever they were trying to use them against. Garindan, when he was living on Kubindi, had been considered a pretty smart guy, but not good smart. He’d been bad smart. The kind of smart that tricked you into giving someone money for doing nothing. The Kubaz, it would be fair to say, didn’t really take to bad smart Garindan. So, at the mere age of twenty-three, his own father had kicked him off the planet and said that if he returned, he’d find himself in a salad along side a jug of blue milk and a plate of diced nerfsteak. They were lovely, his family, they really were. And then, after four years of living on the sandy plains of Tatooine, a job came up. It was this one Imperial officer that came up to him. A blobby sort of nose, and weak blonde hair, like a badly brewed caf with too much Bantha milk in, and watery, pale blue eyes. “Are you Garindan of the Kubaz?” the officer said, in an assertive, superior tone. The officer frowned, and, spying a protocol droid lying around, ordered it to translate the whirring, beeping sounds that came from Garindan’s mouth. The officer bored his pathetic little eyes into Garindan’s goggles. Garindan considered for a moment. He didn’t have any trouble with the Empire that he knew of, but wouldn’t want to make an enemy out of them by refusing. He agreed. With that, he and his two bodyguards walked into the distance. Droids, eh? Shouldn’t be hard to find, he thought. They’ll all be outside the cantina. Garindan was met with a yowl and a flash of blue light as he entered the cantina, and an arm on the floor. He ignored it. He’d seen worse. Like when those two Trandoshans had told that joke about the Wookiee and the Wookiee hadn’t been that happy. That had been here too, come to think of it. What was that lump of fur’s name again? Chewbacca? That was the one. Chewbacca. Always accompanied by a bravado-craving idiot with a good ship. Garindan had always meant to win that off that moron with his ridiculously self-glorifying braggadocio. Like how he’d made the Kessel Run in twelve parsecs. Blustery nonsense, but the ship was good, and Garindan hadn’t learnt how to cheat at sabacc for nothing. He sat down opposite another Kubaz he recognised – Rikard Lovas. Some kind of banker who’d been caught up in some kind of science mumbo-jumbo in the Western Reaches. Garindan couldn’t care less. It wasn’t like anybody from the Western Reaches could ever affect anything, after all. Lovas acknowledged him, and Garindan tossed him a credit to buy him a glass of Vosh. All the while, Garindan was looking around for the two droids that Imperial airhead had described. An astromech and a protocol droid. That, he thought, wasn’t very specific, but he’d try to squeeze what he could out of Lovas. “You hear about that Doctor Evazan?” Lovas squeaked as he got back to the table. “Yeah, I did. A silver-and-blue astromech with an attitude and some overly chatty golden protocol droid.” Garindan’s memory flashed back to the protocol droid that Titus had used to translate from Kubazian to Basic. It was gold… and hadn’t there been a silver-blue astromech by a speeder nearby? “Lovas, I’m sorry about this, but you’re not getting this bounty,” Garindan said, and blasted the other Kubaz with a stun bolt. Rikard Lovas’ head thudded against the table dully. “Always knew he was a bit thick,” Garindan joked, and threw a couple of wupuipi coins onto the counter. One coin hit a riled Devaronian, and that was Garindan’s cue to scram. Garindan then stowed his comlink into the depths of his robes, alongside his his trusted DL-40 blaster pistol and vibroblade. Walking through the passage to the entrance, he saw a huge alien whose species he couldn’t identify waddling on its five-foot legs, slowly and steadily, behind him. He even saw someone walking under the huge pair of legs! He suspected it was probably a genetic experiment. Eww. Thinking mindlessly about what type of alien it could have been, he espied the sandtrooper captain. “I’ve seen them!” Garindan exclaimed. The sandtrooper looked blank. Clearly his Kabazian wasn’t up to scratch. “Which way?” he asked gruffly. Brutish sleemo, Garindan thought, pointing in the direction of Docking Bay 94. You’d think the Empire would hire heads with brains in them to put inside those plastic buckets. Apparently, every stormtrooper was trained for years in a specialist Academy. Did they train them to fire at the ceiling? And consume the most obvious of lies? Garindan shook his head, smiling to himself behind the metal cone he used to cover his face. That was when the trouble began. Just three minutes after selling out those droids, a sandtrooper came charging back out of the entrance, holding one hand to a visible blaster wound on his chest, and jamming his blaster rifle into Garindan’s stomach. Garindan was honestly completely bewildered. Nevertheless, he could tell he was in some pretty deep pudu. “You’re dead, snoot scum,” the sandtrooper growled, and Garindan could hear the click of the trooper priming his blaster. Garindan sighed in pity and slashed the blaster in half with his vibroblade. The trooper looked bemused, and Garindan made it quick for the buffoon, silencing him with a heavy blaster bolt to the head. A shame they didn’t make those helmets blaster-proof, he thought, as he tossed away the trooper’s T-21 rifle and picked the data chip up out of his safety pocket. Davin Felth, Sergeant 1023. Poor guy, Garindan thought, stepping on and crushing the data chip beneath his foot. Nobody’ll ever know who the kid was. Fast forward to: 11 ABE. Jakku. What complete wreck of a planet. Nothing but downed Imperial cruisers and walkers from the battle that ended it all. Garindan couldn’t care less, as per usual. He remembered, once, in a cantina on a planet similar to this, Tatooine, he’d sold out a pair of droids to the Empire. Ha! The Empire. That was a funny joke. Garindan had been astonished that an organization led by an apparently ingenious Sith Lord had built one battle station – gotten it blown up – then built another one of the same design – and gotten it blown up! Sometimes Garindan questioned the authority of these governments. Shouldn’t there be smart people on those floating pods in that fabled Senate everybody was droning on about? He doubted Kubaz had a seat in the Senate of the New Republic. He doubted all those Hosnians, and those aristocratic dewback breeders, that all went to Canto Bight for a good old laugh and to lose a thousand credits in a night, cared about a world of non-humans that wore goggles and metal cones because they were ashamed of the way they looked. Niima Outpost wasn’t exactly Canto Bight Casino, but it had its ups. A transport would come in every so often, carrying stuff Garindan needed, like face-cone replacements and goggle-tints. The Crolute that ran the place, Plutt, was a stingy little nerf-herder, that was a fact, but Garindan knew the right people to scour the walkers and destroyers for the right things. Those people normally ended up on the wrong side of Garindan’s vibroblade if they tried to barter for more than a twenty per cent share, but some behaved and managed to keep in Zuvio’s good books. Sarco Plank was a worthy acquaintance; he sold amplified weapons here on Jakku that Garindan could sell to the Teedos for a lot more than he’d bought them. Heaven knows how Plank had obtained so many Trandoshan Triplers, but Garindan wasn’t one to ask questions. That was until one day, a day that would change Garindan’s life forever. A transport landed in the Outpost’s docking bay, a Correllian, probably worth a considerable amount. At first, Garindan didn’t take any notice. That was until he heard a small girl screaming. Usually, Garindan would have ignored such a thing, but today, he felt an odd urge to go and help. Maybe it was that Force trash that everyone talked about. Nevertheless, Garindan followed the sound of the noise, pistol primed an vibroblade unsheathed. He saw two human adults, genders unidentifiable from this distance, and a small human female, arm in Unkar Plutt’s slimy, fat grasp. The two adults ran to a quadjumper they found in the bay and hastily, and before Garindan could intervene, it had taken off. The Correllian ship was left behind. Garindan thought he recognized it. He did! He’d seen it taking off, fifteen years before, out of Mos Eisley Spaceport… was that – the Millennium Falcon? Garindan gasped in surprise and rushed over to the fat Crolute. “Who was that flying that ship?” he whirred and beeped. “No can do, blobby,” Garindan squeaked, and he stunned the Crolute with a quick blast. He gestured for the kid to follow him over to his speeder, and signalled for her to sit in the cargo net. It was red, like a vertical metal slab. He revved it up and sped across the sands. He knew exactly where he was going – home. If this kid was a newbie, he would protect her with his life. He couldn’t fathom why; it was as if someone had left his brain and controlled his body. They reached the downed AT-AT he called home and the kid scurried away. Garindan fetched his translator cone and put it on. “Who are you?” the kid asked. “I am Rey,” she replied. The helmet had belonged to Captain Dosmit Ræh of the Yellow Aces. Garindan had picked it up at the Outpost a year back, from a shady-looking Ithorian. He hadn’t sold it, for some reason. When Garindan looked back at the newly-dubbed Rey, she was gone. She was hiding in the cockpit of the AT-AT, and she was clutching Garindan’s quarterstaff. “Sorry,” she squeaked, handing it back to him. He pushed it back. And for the first time in his life, Garindan felt compassion for someone else. He’d protect this girl with his life. Suddenly, Rey’s face went pale. “Look out!” she screamed, and Garindan snapped back behind him, but it was already too late. The blaster bolt had punched mercilessly into his back. He fell, and saw none other than Rikard Lovas standing above him, DT-29 blaster pistol in hand. “Got you back, ’Rindan,” he beeped. “Lovas. You little sleemo,” Garindan said. It was difficult to speak now, as the heavy bolt had scraped his diaphragm. In a flash, Garindan quick-drew his blaster and silenced Lovas with his signature bolt to the head. And with that, the mighty con artist, murderer and cheat, Garindan “Long Snoot” of the Kubaz, breathed his last breath, not knowing he had single-handedly triggered a story that would be retold for many, many years to come.